Last few months mass media, controlled by NGCA authorities, spread the information about ‘humanitarian program’ to ‘reunite Donbas people’. In the ranks of it inhabitants of free territories are suggested to visit ‘Orthodox and cultural places’ and also to get a number of social services in NGCA. Not so long ago pro-Russian websites published videorecords and articles, in which is told that children from a free territory of Donetsk region have visited temporary uncontrolled to Ukrainian Government Donetsk in the ranks of appointed ‘program’. The correspondent of Informator.media tried to look into the situation. 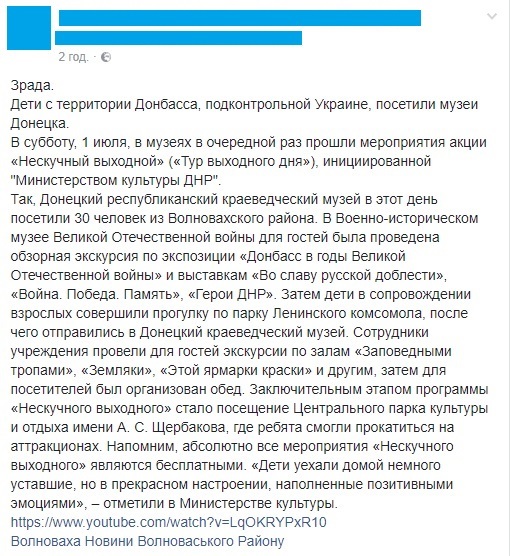 Social media users report that during few months fighters at their block-posts have been distributing flyers that refer to the ‘humanitarian program’ terms and also call to visit NGCA of Donetsk region. Here are the examples of such a leaflets – photocopies are published in the social media. 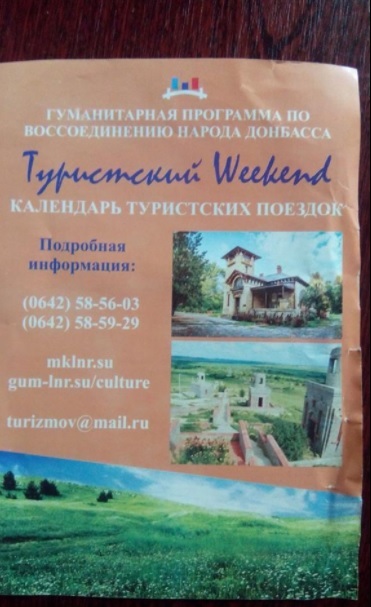 There are invites to visit uncontrolled Luhansk in them. By the way, the information about kids’ journeys in controlled by ‘DPR’ fighters Donetsk, which was published by NGCA media, is hotly debated in the web. ‘Treachery. Kids from Donbass territory, controlled by Ukraine, have visited the Donetsk museum. 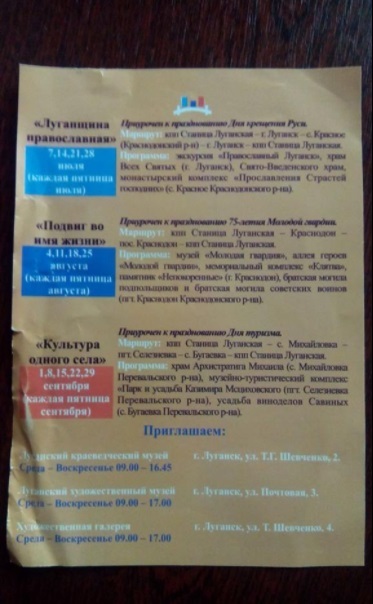 One more time events of the action ‘Not boring output’ (“Weekend Tour’), initiated by the /Ministry of Culture of DPR’. 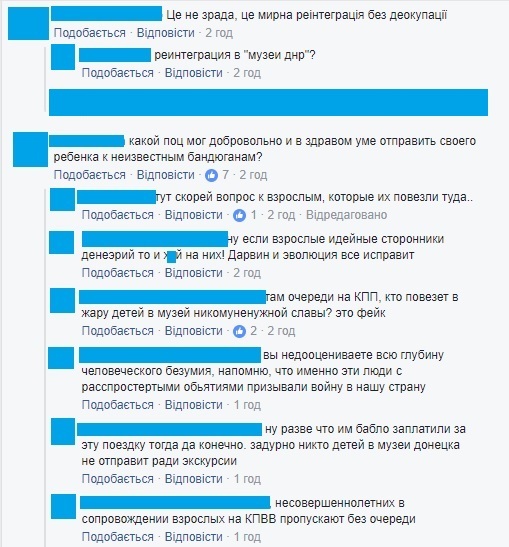 So, 30 people from Volnovakha district visited Donetsk Republic Local History Museum that day’, Facebook users quote the message of one pro-Russian website. Also, users expressed their treatment to the situation in the comments to appointed post. Opinions divided. Some commentators considered information fake and advised not to trust to it, because alike journeys are not really possible, according to their opinion. Other suppose that such voyages are possible, if children were crossing the checkpoint together with parents or custodians and after that ‘guides’ have already met ‘tourists’ in the uncontrolled area. Otherwise, users outraged both by the invitation of NGCA ‘authorities’, and by the fact that someone could answer it with consent and take owns children to Donetsk ‘on an excursion’. According to users’ opinion, kids mustn’t visit captured by fighters territory so as not to be exposed to anti-Ukrainian propaganda. Also, people write that pro-Russian propagandist machine is working very actively, while the Ukrainian side isn’t able to protect its citizens from the impact of the information field of the invaders. The information caused discussion among social workers, journalists, educators and parents. ‘It’s not really so simple to gather a ‘group’ of kids and to carry them on excursion in Donetsk: there will be needed minimum one organizer in the place, which will provide full information and explain that to cross the Line of Contact the Notarial power of attorney from parents or guardians, written out for a specific person who will cross the checkpoint with child is needed. Given the fact that public transport with licenses for transportation don’t cross the line, it will be hard enough to manage something alike. Of course, provided that all Ukrainian civil servants conscientiously serve. However, such ‘services’ could be used by parents privately and there are already more questions to the Ukrainian government and local authorities, what actions are they taking to keep the youth on the frontline in ‘their own orbit’, because in summer, children have a lot of free time, and their parents often don’t have enough resources for full rest. And, unfortunately, volunteer master classes on modeling from the test and origami aren’t sufficient for the full development of children’, Alexandra Dvoretskaya, the Head of the Board of ‘Vostok-SOS’ says. The journalists appealed to the Director of the Department of Education and Science of the Donetsk Regional State Administration, Nadezhda Oksenchuk, who asked for an official request to be sent so that the Department could submit a comment. A speaker of the State Border Guard Service of Ukraine Oleg Slobodyan refused to comment, referring to the fact that such a request must be done by the Donetsk Regional State Administration or the Ministry of Education and Science. Requests of Informator.media were directed into both facilities. In pursuit of a picture NGCA media distorts information about the real state of affairs. The names of districts that before the armed conflict were part of the administrative-territorial structure of the Donetsk region are sounded in the plots of pro-Russian propagandists. This is being made without clarifications, that there are controllable and uncontrollable areas to Ukraine in these districts at this time. And then it’s reported that Donetsk was visited by kids ostensibly from a free part of a region. So, Shevchenko village of Telmanovo district (NGCA) is appointed in the materials, that are spreaded by controlled by fighters mass media. We would remind also that Volnovakha district has few settlements, which are controlled by ‘DPR’. For example Elenovka, Andreevsk and Lyubovsk village councils are in Volnovakha district, but not under control of Ukraine. Otherwise, the fears of visiting children from the controlled territories of the NGCA are still justified. The correspondent of Informator.media found out it from owns sources. The situation was commented by the head of Department of Education of Konstantinovka (Donetsk region) Olga Barabash. According to her words, organized trips of children from free territory to uncontrollable are impossible. ‘First of all, an order of the Department of Education and science, permission to cross the demarcation line will be needed for such a journey… Of course, it didn’t happen, it’s impossible!’, Barabash reported. The head of Department emphasized that employees of the education sector from time to time receive letters from outside the control area, which contain invitations to visit NGCA: ‘There were some invitations on some ‘conferences’, events, connected with ‘Russian language’, but there weren’t invitations on ‘excursions in Donetsk’ for children, I don’t remember such things’. Anonymous sources confirm that children from free territory of Volnovakha district visited Donetsk after all. In spite of a fact that position, sounded by Olga Barabash is clear – such ‘events’ can’t be officially approved by them, a number of teachers from a few settlements conduct ‘agitation’ in private. ‘They (school teachers – ed.) tell to parents of pupils, who are ready to listen them, how ‘life is beautiful in ‘DPR’, they say: ‘You will go and see it by your own. You’re very much awaited there and stuff like this. And they hear ‘basis’ there – ‘bad Ukraine, ‘DPR’ heroes, ‘junta’, ‘nazis’, everything is given by Russian manuals. Children are children, they absorb any information. The danger is that the child isn’t able to distinguish between good and evil, and believes in adults. For such ‘agitation’ these ‘teachers’ are paid money. And thanks to the visits of children from the free territory, a picture is created for the media – both ours and Russian ones. And soon there won’t be any sober arguments to present’, the source said. The staff of educational facilities in other settlements of Donetsk region gave the commentaries anonymously. They confirmed, that received such letters, but, ‘of course, they didn’t react at them in any way’. ‘Parents are another case. It’s worth paying tribute to a fact that people understand in general that there is no need to carry children to the occupied cities. But, there are those, surprisingly, who consider that it’s nothing special in such journeys and they go with their children through the checkpoints and already there (in NGCA – ed.) ‘tourists groups’ are formed, as I understand. But there are in general children, who live in ‘LPR’ and ‘DPR’, but not in the free part of regions. This is from the stories of those who traveled’, the source reported. Our correspondent managed to communicate with one of the females inhabitants of Konstantinovka, whose relative regularly goes in NGCA with owns kids. ‘My neighbour goes permanently and went there even before this ‘humanitarian program’. She says: ‘And what’s wrong with that? Let them look around and see the truth’. Simply, she considers that by such a way she could teach her children to look at the situation from both sides. I was arguing with her about this a lot of times, was saying that it’s not normal to carry children to watch on an occupation and fighters, that it’s the PR-action of ‘DPR’ for the fooling of the people… She doesn’t hear. Thanks to lord, there are not so a lot like her, but it’s enough of them to send children, who will not know after that where’s their Motherland’, a woman told. According to her words, ‘when everyone grasps, that there nothing to learn for their kids, that they must love Ukraine, but not teach how to hate it and call Russia, maybe, we will become a normal country’.